From Butler Library to Macy Villa. In March 2010, I finally made the Ivy League. Not the way you think, though—my grades/ambition and my family’s funds were always too low for me to even consider getting into Columbia, but I finally got a glimpse of Ivy League campus life when I was asked to do a Forgotten New York slide show and lecture, which turned out to be at Columbia’s Fayerweather Hall just off Amsterdam Avenue. 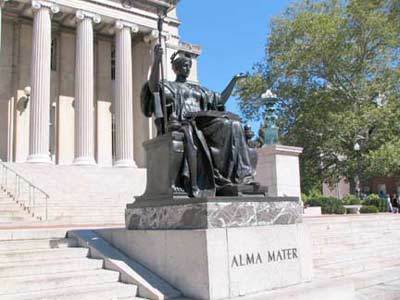 The Columbia University campus runs from W. 114th to W. 120th Streets between Broadway and Amsterdam Avenue. As Kings College, founded in the colonial era, it once occupied a site near City Hall (a West Broadway building sign still says “College Place”) and later moved to the East River site now occupied by Rockefeller University. 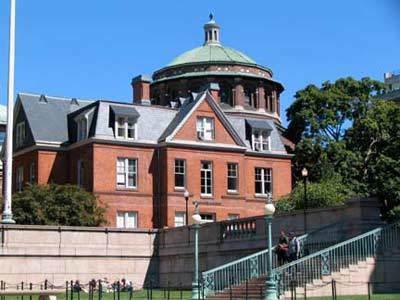 It has been here on its magnificent campus with many buildings designed by Charles McKim of the McKim, Mead and White firm since 1897. There was a time when W. 116th ran right through the school grounds, but it closed to traffic years ago and is now a grand walkway (College Walk) through the center of the campus. This land was once occupied by the Bloomingdale Insane Asylum (Broadway was called Bloomingdale Road at one time, and these sort of institutions were once located in out-of-the-way parts of town, or even better, islands.) The asylum opened in 1821 and was in operation until the mid-1880s. 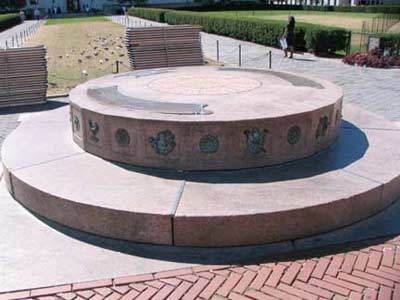 Many who pass by the Sundial (a campus fixture for over nine decades) on College Walk are unaware that only half of it is on display. There was once a 16-ton polished green granite globe positioned on top of it, a gift in 1914 from the Columbia College class of 1885. The sphere began to develop cracks in 1944 and was removed in 1946. For a time Columbia did not know its whereabouts, but it turned up in a field in Ann Arbor, MI in 2001; efforts to reclaim it have so far been unsuccessful. Butler Library has one of the city’s longest Ionic colonnades with 14 pillars. It is relatively new for classic-styled architecture, having been finished in 1934. 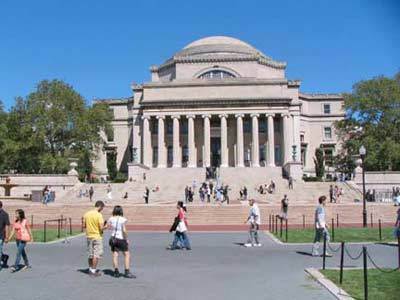 It was named for Columbia president Nicholas Murray Butler, who lived 11 more years after its dedication. 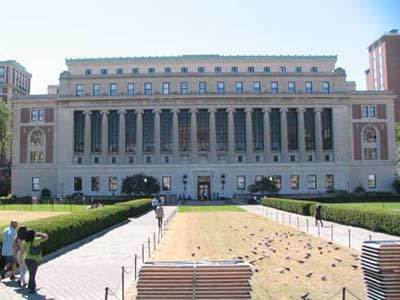 The Low Memorial Library was a charter member of Columbia University, completed 1897 by Charles McKim. It was named for the father of Brooklyn mayor, then Columbia president (and later NYC Mayor) Seth Low (1850-1916), merchant A. A. Low. It has become a ceremonial space in recent decades. The Butler Library out-columns it, 14 to 10. There was once a rowing track and canvas tank for Columbia’s crew team in the basement. Daniel Chester French’s Alma Mater (1903) greets students, faculty, and passersby. Currently bronze-colored, she has been gilded in gold and green with verdigris during the years. Protesters tried exploding her in the spring of 1970 at the height of Vietnam War unrest, but she survived. The Macy Villa, now Maison Française, Columbia’s center of French culture, is the oldest building on campus and the only leftover from the asylum days. Officially it is known as Buell Hall; when built in 1885, it took its name from principal donor, William H. Macy (not, of course, the red-headed actor of Fargo and Sleepless fame). The Villa adjoins St. Paul’s Chapel, a gift from the Stokes family of industrialists/philanthropists, completed in 1907. A member of the Stokes family, Isaac Newton Phelps Stokes, was a partner in the firm that built it; Stokes also wrote one of the best Manhattan histories, the massive The Iconography of Manhattan Island.